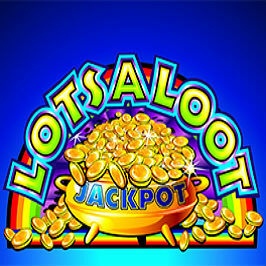 If you like simple, colourful slots with straightforward gameplay and cheap spins then LotsALoot is just the ticket. This cheery five-reel, 25-payline offering from Microgaming also boasts a subtle ‘luck of the Irish’ theme and a sweet medium-sized progressive jackpot. But is it LotsAFun? Play LotsALoot for Real Money! 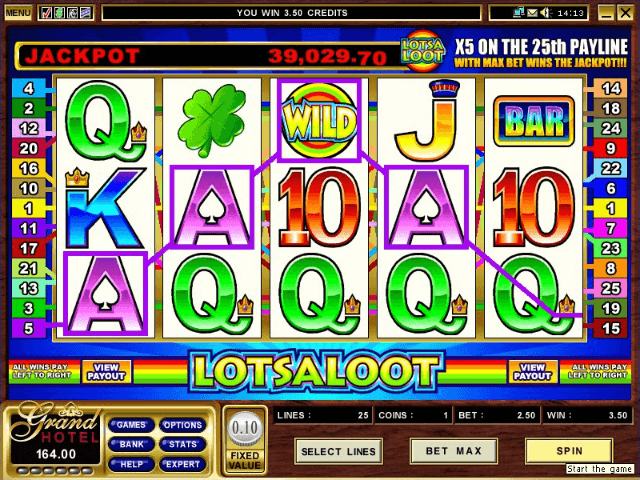 Some of you may remember Microgaming’s initial, three-reel version of LotsALoot. This updated variant is brighter and bolder than its predecessor, with rainbow-coloured symbols and clear, crisp reels flooding the screen. That being said, it’s still one of Microgaming’s more basic games and as such the lack of any sophisticated graphics or appealing backgrounds make it feel rather dated. Other factors which may put more contemporary gamers off include the fixed coin value and the absence of any conventional bonus rounds. The fixed coin value just mentioned is £0.10. Do the maths and you’ll quickly realise your bet sizes will range from 10p to a high of £2.50, should you bet the maximum number of coins. This basically means that, at the minimum per spin value, you could hit a jackpot worth £2,500 – while a payout of £250,000 could be yours if you go all-in with your spins. 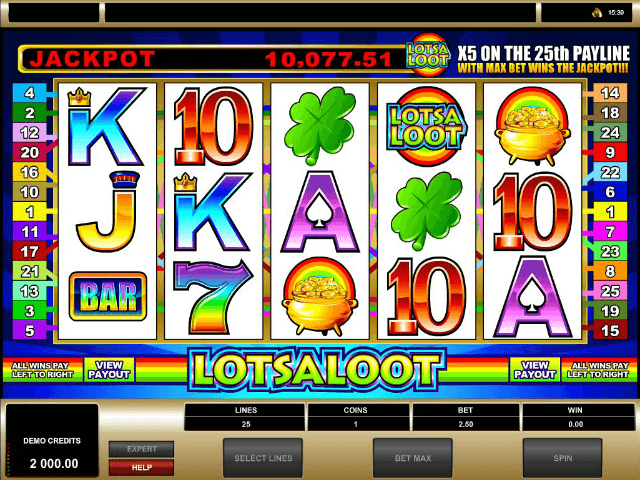 The traditional Irish-themed symbols are what give the LotsALoot slot game its faint Gallic vibe. Four-leaf clovers, pots of gold, bars (not pubs, mind), and rainbow-coloured sevens make up the game’s high value symbols. 10, J, Q, K and A round out the lower value motifs. The highest-paying value symbol of all is the pot of gold, followed by the rainbow 7. Five of these pay out 750x or 500x respectively. The rather garish-looking LotsALoot logo is the wild and substitutes for all other symbols. Land five of these in a row and you’ll net a handsome payout of 10,000 coins. A grand reward, to be sure. As mentioned earlier, the bonus hunters among you may feel compelled to look elsewhere as this Microgaming classic has no real bonus features or Free Spins rounds to speak of. On the plus side, there’s a genuinely enticing progressive jackpot on offer which, more often than not, is worth sticking around for. Look above the colourful reels and you’ll see the LotsALoot online slot game’s progressive jackpot total ticking relentlessly upwards. To be in with a chance of bagging it though you’ll need to ensure you bet the maximum amount (although that’s only £2.50) and play the maximum number of paylines. If you do that and manage to land five LotsALoot wild symbols on the 25th payline then you could well find a real pot of gold. One made up of thousands or even tens of thousands of pounds (if you’re really lucky) at the end of your gaming rainbow. 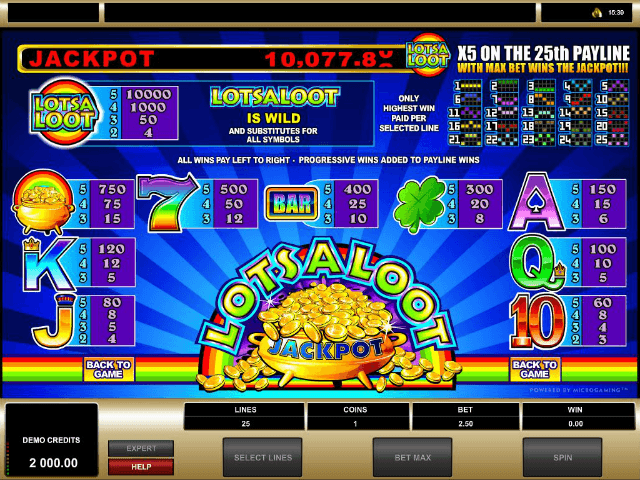 If you’re a fan of ‘what you see is what you get’-type offerings then the LotsALoot slot game will doubtless keep you amused for a while, more so if the progressive jackpot is on the up-and-up. If you’re after something a little more sophisticated or varied though then this may not be the game for you. Some seasoned punters may consider the sub 90% RTP a reason to look elsewhere as well. Share this LotsALoot Review today! 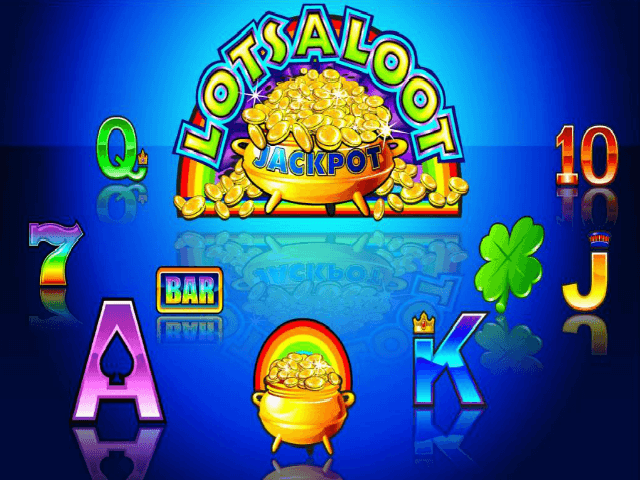 If you like LotsALoot, you'll love these slot titles too!